You may not have heard of this tiny seed, but if you enjoy Indian cuisine, you’ll certainly have tasted it. Those little black nuggets of flavour in your naan bread, and often in curry dishes, are Nigella. 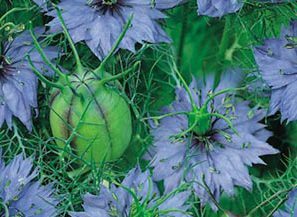 The seeds come from a popular garden plant, Love in a Mist, whose beautiful cornflower blue flowers turn to papery pods which scatter the seed when the wind blows. Nigella comes with many names: Black Onion Seed, Black Cumin, Black Sesame, Black Coriander, Black Caraway and Roman Coriander. Sometimes it’s referred to simply as Black Seed. And it is black. But flavour is just one of its properties. There have been many studies now on how Nigella can benefit health, and there is increasing evidence of its ability to combat many modern diseases. Type 2 diabetes – Researchers found that a daily dose of just two grams black seed could result in reduced fasting blood sugar levels, decreased insulin resistance, and increased beta-cell function in the pancreas. Epilepsy – Medical Science Monitor, followed one study, in which black seed was shown to be effective at reducing the frequency of seizures in children who resisted conventional treatment. Black seed has anti-convulsive properties. MRSA – This deadly and antibiotic-resistant bacterial infection responded favorably to treatment with black seed in this study from the University of Health Sciences in Lahore, Pakistan. Brain Damage from Lead – Experimental and Toxicologic Pathology highlighted a study which indicates black seed can reduce and even reverse brain damage caused by lead toxicity. High blood pressure – Researchers found that an extract from black seed caused a significant decrease in LDL cholesterol and blood pressure, offering a natural treatment for mild forms of hypertension. Asthma – Multiple studies found Nigella Sativa to possess anti-asthmatic effects. One even found it superior to conventional drug treatment. 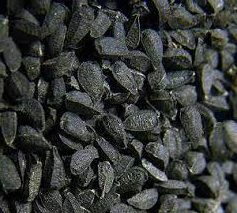 Sore throat – Research indicates that Black Seed can relieve viral sore throats. Morphine Addiction and Toxicity Prevention – A study published in Ancient Science of Life found Nigella Sativa reduced morphine intoxication, tolerance, and addiction. Psoriasis – Applied topically to psoriasis inflammation, black seed was able to increase epidermal thickness and soothe eruptions. Parkinson’s Disease – An extract of thymoquinone, from black seed, was shown to protect neurons from toxicity associated with Parkinson’s disease and dementia in a study published in Neuroscience Letters. Taking nigella may also slow some forms of cancer growth and stop its spread, but do not replace conventional treatment in favour of this seed. Studies show promise, but are still ongoing. The presence of thymoquinone in nigella can trigger apoptosis (cell death) of cancer cells, but more research is needed.